PHI KAPPA TAU HOUSE CORPORATION P.O. BOX 607 STARKVILLE, MS 39760 Address Service Requested ATTENTION: This newsletter is intended for alumni and parents. 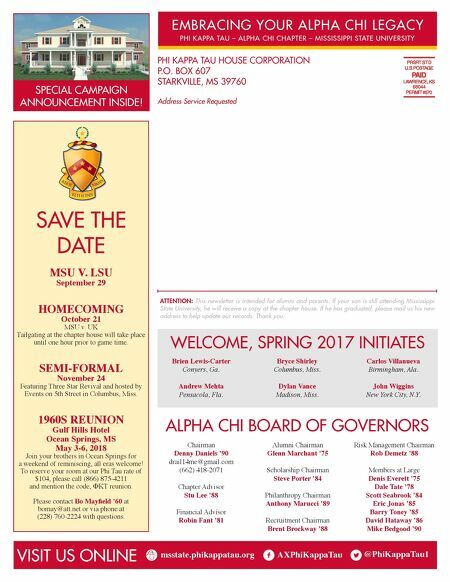 If your son is still attending Mississippi State University, he will receive a copy at the chapter house. If he has graduated, please mail us his new address to help update our records. Thank you. SAVE THE DATE MSU V. LSU September 29 HOMECOMING October 21 MSU v. UK Tailgating at the chapter house will take place until one hour prior to game time. SEMI-FORMAL November 24 Featuring Three Star Revival and hosted by Events on 5th Street in Columbus, Miss. 1960S REUNION Gulf Hills Hotel Ocean Springs, MS May 3-6, 2018 Join your brothers in Ocean Springs for a weekend of reminiscing, all eras welcome! To reserve your room at our Phi Tau rate of $104, please call (866) 875-4211 and mention the code, ΦKT reunion. Please contact Bo Mayfield '60 at bomay@att.net or via phone at (228) 760-2224 with questions. Brien Lewis-Carter Conyers, Ga. Andrew Mehta Pensacola, Fla. Bryce Shirley Columbus, Miss. Dylan Vance Madison, Miss. Carlos Villanueva Birmingham, Ala. John Wiggins New York City, N.Y. WELCOME, SPRING 2017 INITIATES Chairman Denny Daniels '90 drail14me@gmail.com (662) 418-2071 Chapter Advisor Stu Lee '88 Financial Advisor Robin Fant '81 Alumni Chairman Glenn Marchant '75 Scholarship Chairman Steve Porter '84 Philanthropy Chairman Anthony Marucci '89 Recruitment Chairman Brent Brockway '88 Risk Management Chairman Rob Demetz '88 Members at Large Denis Everett '75 Dale Tate '78 Scott Seabrook '84 Eric Jonas '85 Barry Toney '85 David Hataway '86 Mike Bedgood '90 ALPHA CHI BOARD OF GOVERNORS @PhiKappaTau1 VISIT US ONLINE msstate.phikappatau.org AXPhiKappaTau f l 8 EMBRACING YOUR ALPHA CHI LEGACY PHI KAPPA TAU – ALPHA CHI CHAPTER – MISSISSIPPI STATE UNIVERSITY SPECIAL CAMPAIGN ANNOUNCEMENT INSIDE!